I love hearing about a great idea! Don’t you? 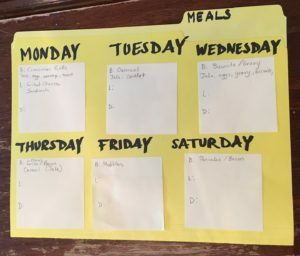 Recently, a friend shared her method for keeping track of meals for her family. It was simple and sweet, covering what she needed in a way that was easy to access. A yellow file folder had all seven days of the week written in black marker on it. Under each day was a sticky note with three meals written out. At the end of the week, all she has to do is remove the sticky notes and start over. The plan is to eventually have the breakfast for each day of the week be the same, so then it could be written on the folder also. Then, the sticky notes would only need to have lunch and dinner on them, saving one step each time. Also, the sticky notes can be stored inside the folder to be reused in the future, giving meal ideas and saving time writing them out again. The folder is kept with several other household folders, keeping bills and school records and such ordered and within reach during the week. I love it! Perhaps you will too. The same process could be done by hole-punching the folder and including it in your household binder, if that is your tool of choice. Once the breakfast is included on the folder itself, smaller notes (i.e., 2×3 instead of 3×3) could be used for lunch and dinner plans. You could also use the really small sticky notes to have lunch on one and dinner on another for each day. That would let you re-use individual meals easily when you did your meal planning. If you plan two weeks or a month at a time, you could have two or four folders set up and ready to go. What a great idea!!! I love it.